Question: What is the best asset allocation for you? For the answer go to the end of the article. There are many studies that say that asset allocation is the single most important decision investors will make. Estimates range from a low of 33 percent to a high of more than 100 percent on the impact to returns on any given portfolio. How much of the variability of returns across time is explained by the asset allocation strategy? How much of the fund’s volatility does its asset allocation strategy justify? How much of the variation in returns among funds is explained by the differences between the asset allocation strategies? How much of the different portfolios’ performances can be explained as a result of the asset allocation difference? What is the ratio of a fund’s performance using its asset allocation strategy to the benchmark returns? Financial scholars attempting to answer these questions came back with a range of different impacts as illustrated in Exhibit 1. 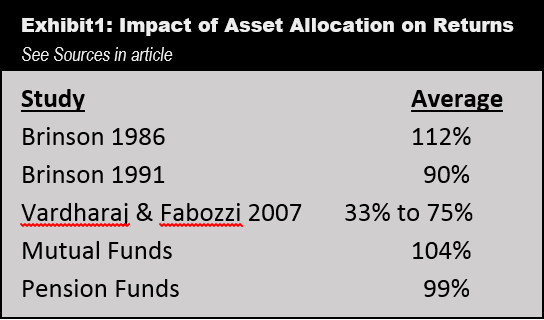 The jury is out on the absolute percentage impact that the “asset allocation” decision has on the investment portfolio. We believe that asset allocation does explain a great deal but not all. For example, brokerage firms mandating “in-house” mutual fund sales, inept investment selection, high fees, tough to match benchmarks, micro asset allocation choices, and a manager’s style drift can impact returns as well. In the end, we believe asset allocation is the single most important investment decision, and we outline how the best advisors do it using passive asset allocation models. Other Avoidable Risks: This is the risk associated with paying more in management fees, adverse asset selection, and in other high fund fees. An investor can be exposed to the same asset class using different funds, but instead of the rewards going to the investor, they get eaten up by investment costs. An example of other avoidable risks would be investing in a mutual fund with high fees and a front-end load. 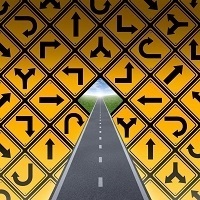 Focus on exchange-traded index funds that are the “best-of-class,” low-cost, and that are scored well using independent research provided by Gurufocus.com, the Center for Fiduciary Studies (FI360.com), and Morningstar.com. You cannot eliminate the market risk of a given sector or asset class, which is why asset allocation is so important. Company-specific risk may be reduced by diversification within a sector or asset class by using exchange-traded index funds. Moreover, we may minimize the adverse impact of “other avoidable risks” such as high fees that can be minimized by utilizing cost-effective ETFs and by using third-party scoring systems like Guru Focus, Morningstar, and FI360. Not all investors have the same risk tolerance. As a result, CAG tailors portfolios to match return targets, as well as other risk factors such as: how much clients are willing to lose in bad markets, when clients plan on retiring, how secure is their employment, what cash needs are desired, what clients’ long-term outlook is for the U.S. economy, and what investment categories they will consider for an investment. After reviewing a client’s financial situation, cash flow, debt, assets, insurance, and estate plan, CAG does a risk profile to determine the best asset mix given the tolerance for risk. Part of your risk determination is your “time horizon” which is how long you have before the portfolio is needed to generate cash flow. After answering twelve questions, a risk profile score is established scoring from less than 23 to more than 45. The risk model score may be decreased by the advisor, if he or she feels you cannot stand the risk in spite of the score. Conservative Income Portfolio – Score 23 or below This portfolio is most appropriate for investors seeking a steady stream of income with a minimal amount of volatility. Assets are subject to gains or losses. Balanced Portfolio – Score 21 to 31 This portfolio is most appropriate for investors with a five- to fifteen-year time horizon who are looking for a balance between income and growth components with less risk. Assets are subject to gains or losses. Moderate Portfolio – Score 29 to 39 This portfolio is most appropriate for investors with a five- to thirty-year time horizon who are looking for a majority of investments in growth, but with a substantial income component to temper volatility. Assets are subject to gains or losses. Growth Portfolio – Score 37 to 47 This portfolio is appropriate for investors with a five- to forty-year time horizon who are looking for a majority of investments in growth, but with an income to give the optimal balance of volatility and return in client pursuit of long-term growth. Assets are subject to gains or losses. Aggressive Growth Portfolio – Score 45+ This portfolio is most appropriate for investors with at least a fifteen-year time horizon who are looking for a significant growth and are willing to endure substantial year-to-year volatility in that pursuit. Assets are subject to gains or losses. Stock Only Portfolio – Score 45+ This portfolio is for investors wanting to be fully invested in stocks. NOTE: We use our proprietary “dollar-cost-averaging” method which relies upon the “January Effect” to bring clients fully invested in our models. * We have learned that how a person answers these questions may be different than how the clients would feel about losing money. In Exhibit 2 are our company’s Stock-to-Bond ratios (S/B) of several of risk tolerances. We change the asset allocation, depending on market conditions: Green for lower risk and Red for higher risk. To help you answer the question we analyze income, expenses, expected purchases, state and federal taxes, expected retirement, and anything else that could impact cash flow. Then, we watch how the clients are affected by market changes until the asset mix mirrors the clients “actual” risk tolerance in both up and down markets. These assets are subject to gains or losses. *No investment strategy including Dollar Cost Averaging and/or asset allocation can guarantee profits or protection against losses in declining markets. Past Performance is no guarantee of future results. If you want to find out your risk tolerance at no cost, give CAG a call at(952) 831-8243. The answer to the question: What is the best asset allocation for you? The answer will depend on your answers to risk, return, and market expectation. How is your asset allocation stack up? What is your target return? What is your downside risk in poor markets like 2008? Curious about the answers? Call our office at 952-831-8243 to find out, free of charge. Brett Machtig has authored several books and is the founding partner of The Capital Advisory Group Advisory Services, a private asset management and retirement planning services firm located in Bloomington, MN. All together, The Capital Advisory Group Advisory Services has 9 advisors, a CPA partner firm(4*) and an estate planning attorney(5*) that work with approximately 850 clients and 31 institutions, encompassing approximately $280 million. (6) He has been helping affluent investors execute financial strategies, meet income objectives and realize life visions for more than 30 years. Approachable, genuine and down-to-earth, Brett holds himself to a high standard of accountability and seeks to achieve positive financial results on behalf of each client. In this article, Brett shares the effectiveness of each strategy and how to improve it. The information contained does not constitute an offer to buy or sell securities and is provided for illustrative purposes only. The information comes from reliable sources, but no guarantees or warranties are given or implied to its accuracy or validity. The strategies listed do not necessarily reflect those of its publisher, MGI Publications or its authors. Information obtained from publicly available sources listed herein and footnoted where applicable. Securities offered through United Planners Financial Services of America, a Limited Partnership, 480-991-0225 member FINRA/SIPC, 7333 E Doubletree Ranch Rd, Scottsdale, AZ 85258. Advisory Services offered through The Capital Advisory Group, LLC 5270 W. 84th Street, Suite 310, Bloomington, MN 55437, 952-831-8243, an independent registered investment advisor, not affiliated with United Planners Financial Services of America. ADV, Part 2A as of 3/26/2015, available upon request. Many investments are offered by prospectus. You should consider the investment objective, risks, and charges and expenses carefully before investing. Your financial advisor can provide a prospectus, which you should read carefully before investing. An investment in a money market fund is not insured or guaranteed by the Federal Deposit Insurance Corporation (FDIC) or any other government agency. Although a money market fund seeks to preserve the value of your investment at $1.00 per share, it is possible to lose money by investing in a money market fund. Diversification does not guarantee a profit or protect against loss. Please consult your attorney or qualified tax advisor regarding your situation. Asset allocation and rebalancing do not guarantee investment returns and do not eliminate the risk of loss. No investment strategy including Dollar Cost Averaging can guarantee profits or protection against losses in declining markets.